This website terms and conditions template sets out the relationship between your business and merchants who use your website to sell. The goods bought and sold could be anything, to any person, consumer or business. We have provided for basic contract procedures, but delivery information must come from the sellers as it will not be the same for a tee shirt as for an item of industrial plant. Merchants upload necessary information to your site or complete your pre-set data entry boxes. Any other arrangement could be accommodated provided it is via Internet or other electronic medium. First it protects you in law from a huge array of potential problems arising from disputes between your merchants and their clients. Secondly, it enables you to set out how your website works to benefit a merchant. It is assumed that you will insist on some standard terms of sale by all merchants so that a buyer can return to your site later and buy from a different merchant without the terms being markedly different. It is assumed that both merchants and their customers will have access to your website for one or more reasons. We have therefore provided very wide ranging protection. This will be more than you need, but can be edited easily by deletion, as can any text in Net Lawman document. Because each market place website has its own business model, we provide separate agreements for terms with buyers and sellers. You should therefore pair this document with the most suitable seller side marketplace T&C document we offer. See below. This template is for any website that creates a marketplace where goods are sold to either consumers or to businesses. It does not matter what type of goods that may be. This document provides only the terms between you and your sellers. You will need a matching document that regulates the relationship with buyers. Provisions you will need for buyers vary more than those for sellers. So while this document covers any type of seller, we offer several “buyer side” versions. 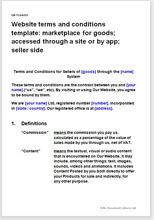 The most appropriate “twin” for this document is Website terms and conditions template: marketplace for goods; accessed through a site or by app; buyer side. The law in these T&C is largely common law that deals with the basics of contracts: offer, acceptance, price and payment, provision of service, delivery, liabilities and risk. By and large, you can set the terms you want, to match your business model. The document can be edited easily so that it reflects exactly how your business works. Our guidance notes will tell you what you can change safely, and what we don't advise changing. This template allows you to comply with the Contract and Commercial Law Act 2017, the Fair Trading Act 1986, the Consumer Guarantees Act 1993 as amended, and other consumer protection legislation allowing your sellers to sell to businesses or consumers.